Mauritius offers a wide range of holiday stays varying from luxurious to rustic accommodation. Infinite stretches of white sandy beaches and turquoise lagoons are not the sole wealth of Mauritius. The island is equally a heaven for panoramic landscapes made of lush forests, mountains, valleys and waterfalls. One of the ideal means to connect with nature is to spend your holidays in the eco-lodges away from the city buzz and pollution. The genesis of the island of Mauritius is founded upon volcanoes which are either extinct or dormant. They have given birth top magnificent craters, waterfalls, lakes, mountains, valleys and caves where the geological wealth is still protected. 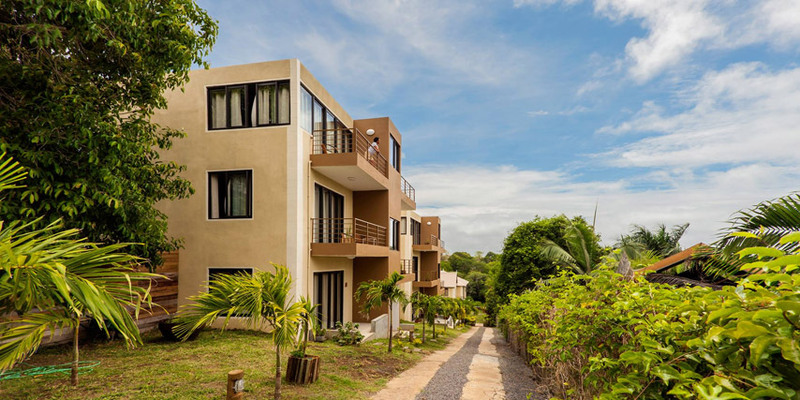 If you are a backpacker, traveller or a tourist looking to spend some quality time in an off-beaten track retreat, then consider Mauritius as the destination of tropical, luxuriant eco-friendly lodges for your up-coming vacation. Tread lightly, breathe the fresh air and surrender yourself in the midst of luxuriant reserves with no one around to bother you - a green vacation submerged with enthralling waterfalls, winding rivers, scintillating, crystal clear turquoise seawater and a myriad of adventurous activities to try! 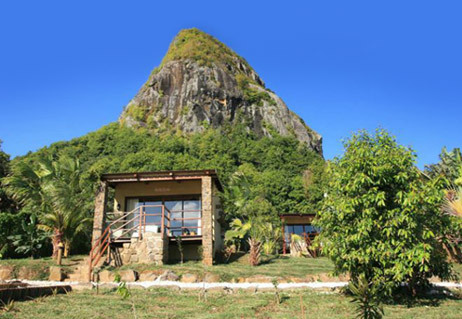 Lakaz Chamarel is an outstanding lodge located in the South West Coast of Mauritius. This is where you will discover a balance of luxurious accommodation in an ecological setting, where you can experience an ultimate level of comfort, relaxation and intimacy. Here, feeling one with Nature does not imply sacrificing any kind of facilities. Typically known for its very peaceful and stunning landscape, Lakaz Chamarel eco-lodge combines refinement and green tourism. It is ideally located by the natural heritage site of the Black River Gorges which is endowed with a diversity of endemic flora and fauna. High up in the green and extremely quiet forests, Lakaz Chamarel offers spectacular views of the hilly lands of Chamarel amidst flower-filled tropical gardens. It is also a true haven of relaxation for romantic couples. Away from the hustle and bustle of the cities, and pollution, this exclusive lodge is a wonderfully conceived collection of rustic, yet elegant cabins offering a blissful getaway amid tropical luxuriant forests, gardens and streams - a totally cut-off experience. Each of its rooms and suites has their own terrace overlooking the lush vegetation and an outdoor shower. They are vibrantly decorated, with chic safari-style trimmings. Not to be missed are the serene spa and the private comforting swimming pool adorned with stone goddess statues-all of which exude a mystical vibe. When you are at Lakaz Chamarel, you do not have to worry about your dining options. You can experience a pleasant meal treat served at the dining room, or on the outdoor terraces. Breakfast is in the form of a buffet with A la Carte option. The lunch menu focuses on light and local meals made with fresh and locally sourced ingredients. In addition, packed lunches can be prepared for those wanting to head for strolls in the vicinity or head to the beach which is approximately at a 15-minutes’ drive. The management can recommend a number of restaurants in the village of Chamarel for those wishing to explore the local culinary specialities. For dinner, there are a number of options from a set menu and a more extensive A la Carte option. If weather permits, an outdoor buffet is sometimes organised to enhance the countryside feeling. To make guests feel at home, Lakaz Chamarel remains flexible regarding meal times, depending on requirements of guests. The lodge provides a babysitting/childcare service at an additional cost. 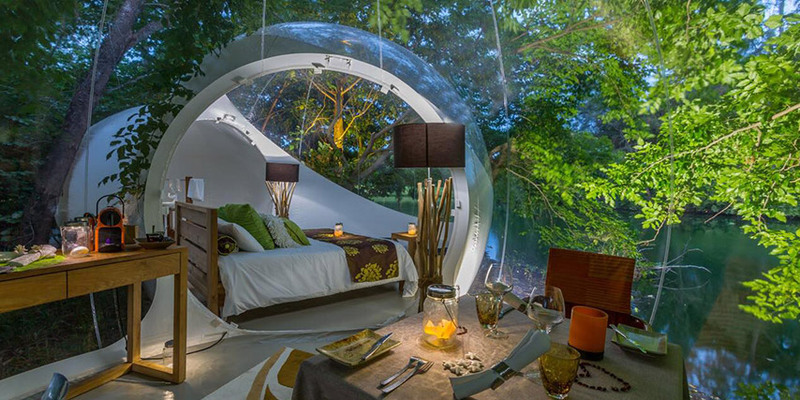 The Bubble Lodge at Domaine de Bois Chéri is a unique concept in Mauritius. Priding itself in its unique outstanding transparent lodge nestled amidst lush velvet tea plantation. The Domaine aims at excelling in service by offering ultimate privacy; guests staying will have the Domaine exclusively for themselves at night in all safety. The Bubble Lodge is an exclusive opportunity to be one with Nature in an innovative manner. 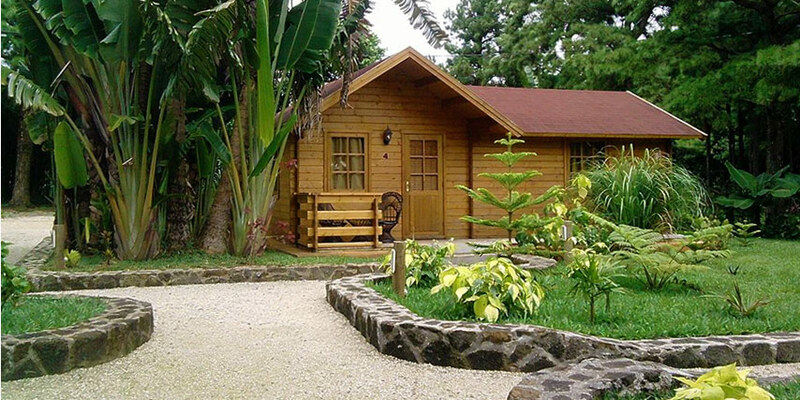 It offers you comfort and privacy in a serene and isolated tea plantation located in the South of Mauritius. The lodge is cosily placed facing an enthralling crater lake with surrounding spans of emerald tea plants and a rather cool environment. It promises you a stargazing retreat - a perfect escape in the midst of a fertile tropical setting. If you are seeking to boost your inner energy and experience a Zen atmosphere during your vacation, you will be lavishly pampered. 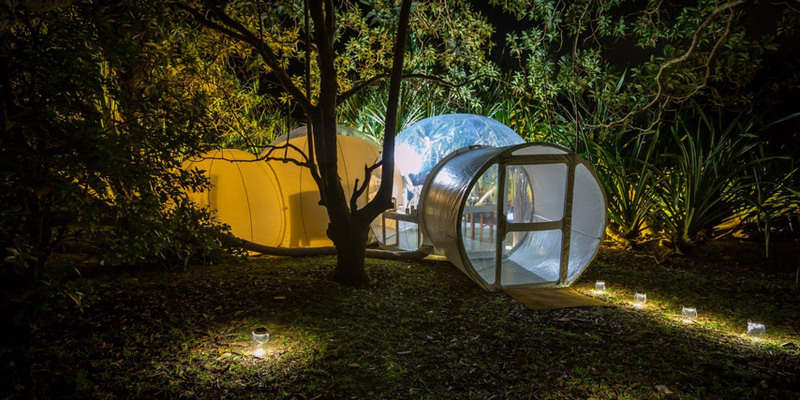 Carefully designed to blend with the ecosystem, the Eco Bubble Lodge lets you embrace the serenity of this unique location which dates back to the 1890s. This lush tea plantation is best discovered on foot and it offers not only a visual richness but also a flavourful richness of the senses. Bois Chéri has enabled the development of a true culture and tradition of tea in Mauritius. Its factory now produces more than half of the island’s tea. The lodge has especially been designed to cater for a sustainable and yet very comfortable stay, where you can contemplate the beauty of nature around you. Created by the French designer Pierre Stephane Dumas, the concept behind this eco-lodge is to ensure a very low environmental impact. The Bubble Lodge has been designed with a rustic décor to really make guests feel one with nature. It consists of 3 units which include three modular bubbles with sitting area, bedroom and bathroom, including an exterior shower, all of which is air-conditioned. The air is renewed throughout. It can accommodate up to 2 adults with 2 children under 16 years old. While enjoying the freshness of the environment you can also indulge in fun complimentary activities like kayaking, paddling, fishing, hiking and tea tasting. Other activities such as golf, quad biking and visit to the tea factory can also be organized. Those wishing to have dinner are sure to enjoy a unique dinner experience having a dedicated chef at their disposal and the restaurant may be reserved exclusively for thems. For your convenience, towels and linens are included as well as an electric kettle inside the lodge. Completely secluded, La Hacienda is a set of four rustic guests houses romantically perched on the side of Lion Mountain in Vieux Grand Port in the South East Coast of Mauritius. 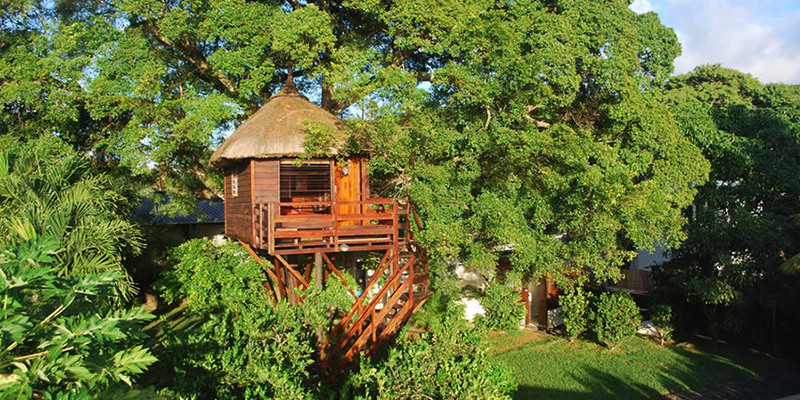 The eco-friendly La Hacienda Guest House welcomes nature lovers and romantics for an intimate and relaxing hideaway. La Hacienda is surrounded by luxuriant native forests and vegetation, and offers an eco-wilderness experience with a stunning panoramic view on the southern seas. The meticulous design of each guest room imparts a budget ‘boutique hotel’ ambiance. To blend perfectly with the rich ecosystem, La Hacienda has been built with local natural materials such as rocks, wood, and plant fibres. The concept behind this eco-lodge is to provide a unique, comfortable and green stay without disturbing the environment. A haven of pure relaxation, the eco-guesthouse consists of 4 categories of guestrooms, notably the Pink Pigeon, Day Gecko, Butterfly, and Hare. 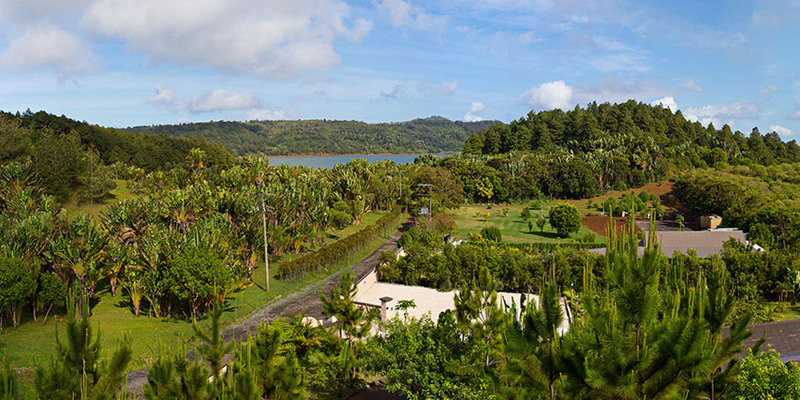 They are each in a secluded and lush green environment overlooking stunning panoramic mountain and sea views. The contemporary rustic guestrooms consist of its self-contained kitchen which includes: microwave, refrigerator, stove, toaster oven, kettle, crockery, pans and utensils. Basic ingredients such as oil, salt, sugar, as well as tea bags are equally at the disposal of guests. So, you can prepare a romantic breakfast meal or dinner at your own leisure. For breakfast, you will be offered a basket with fresh eggs and bread, and dairy products. Those who do not wish to cook can order food at an additional cost. Though, the lodge is suitable for romantic couples, however, provision for children has also been made. For example, there is sofa bed, baby cot and baby chair. If you wish to appreciate the warm summer weather, then step out of your guestroom and indulge in a rejuvenating moment at the common pool overlooking large stretches of luxuriant lands merging with sea views. If you want to get into the wild nature, then venture in the soothing greenness of native forests and sugar cane fields with views over rivers and the sea. This is a perfect time to reconnect yourself with the peaceful nature. Enjoy your time exploring the flora and fauna of the surroundings. You will be warmly pleased to encounter tortoises. You can do mountain biking; self-guided hiking, bird-watching and nature walks to viewpoints on the property and on Lion Mountain. Other fun activities can be organized at the nearby regions if you crave for an adrenaline rush. 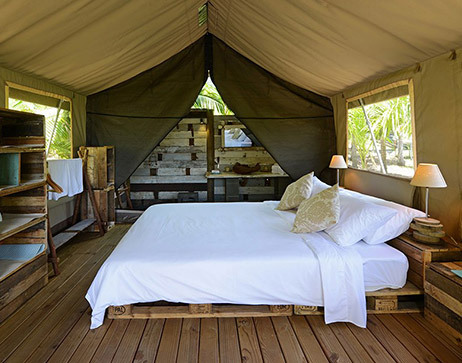 Situated in the Eastern Coast of Mauritius, the ‘Otentic Eco Tent Experience’ lies on the bank of Grand River South East, which is the longest river of the island. This eco-friendly lodge is ideally located at canoeing distance halfway from the waterfall and 22kms of the lagoon of Ile aux Cerfs. 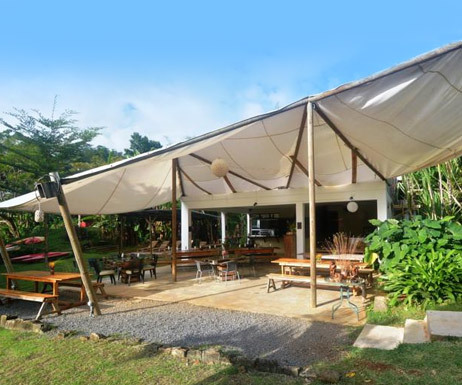 Here, find the authentic Mauritian Creole culture blending with the vibrating lush green palm trees, and verdant wild grasses; giving a feeling of nowhere in a natural and rustic setting - a total cut-off experience indeed! The concept behind Otentic Eco Tent is to be autonomous while taking care of its carbon foot print. Otentic has been built exclusively from wood and recycled materials. Energy is generated through photovoltaic panels and solar water heaters, equally rainwater is harvested. Otentic Eco Tent has 12 safari tents and 2 wooden chalets. Tents are made of canvas and are covered with a fly-sheet to protect from the rain and a knitted shade net to protect from the sun. This double protection ensures that the tents always remain cool and dry no matter how hot and wet the weather gets. Bath sinks are carved from a single piece of wood and are positioned on old wooden doors. Bed mattresses are on transportation palettes and potato boxes are used for storage. Each tent can accommodate up to 2 adults and 3 children. 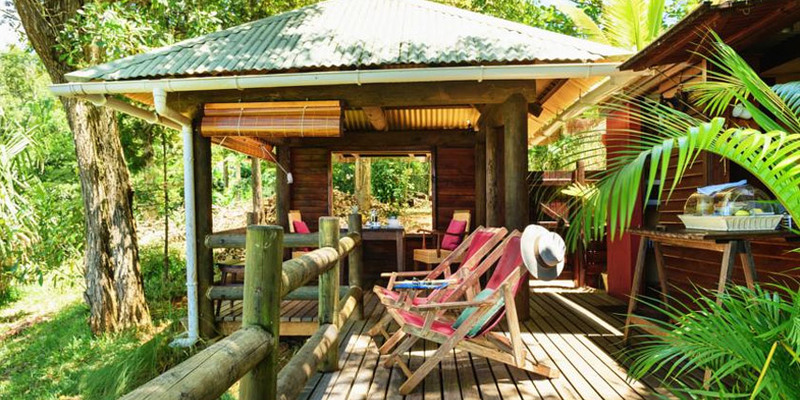 Each of the two wooden chalets has a small terrace under the shade of mango trees. They both have 2 bedrooms and a bathroom. They can accommodate up to 2 adults and 3 children. Additionally, there is a pool side restaurant overlooking the river which serves delicious Mauritian specialties. In the morning, a complimentary continental breakfast made exclusively of fresh local products is served. Freshly brewed espresso coffee, homemade yogurt and natural fruit juices are also provided. Those who wish to get into the adventurous mood can enjoy canoeing, biking and darts for free, as well as scuba diving, snorkeling and fishing at a surcharge. The nearest beach to Otentic is Ile aux Cerfs. There is a free shuttle boat leaving from Otentic every morning and returning for lunch time. The shuttle transfer takes about 20 minutes. 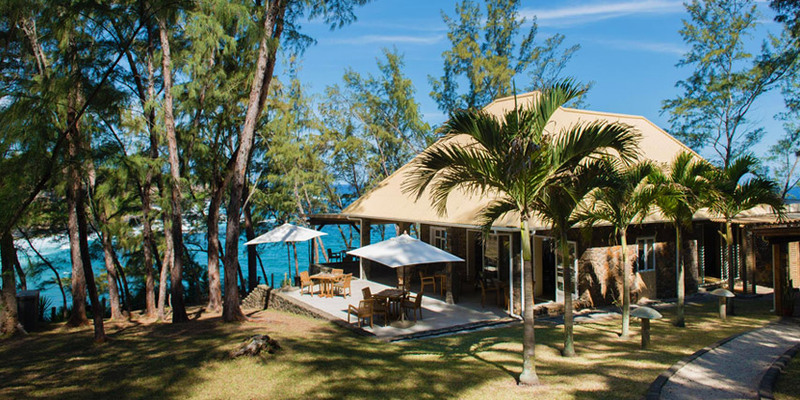 Located in the Eastern Coast of Mauritius, not far from the Belle Mare Plage, the TreeLodge offers you a unique off grid accommodation where you can experience history, culture and natural beauty of Mauritius altogether. 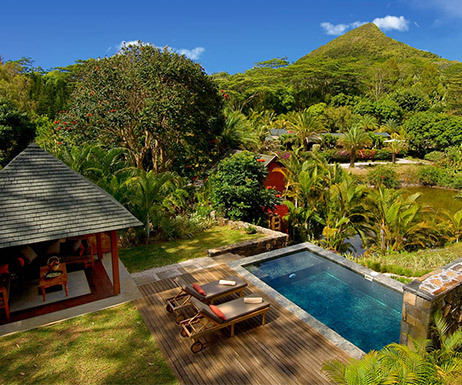 The surrounding of the eco-lodge is charged with the colonial history of Mauritius. Perched in the heart of a massive 100 years Ficus tree, the TreeLodge offers a unique concept of retreat in Mauritius. Built sustainably with strong woods and a thatched roof, the TreeLodge overlooks an exuberant garden, and an inviting swimming pool. Its interior is exquisitely designed in an eco-friendly way. There is a balcony where you get a glimpse of an absolutely incredible view of the turquoise waters of the Belle Mare lagoon. This is your moment where you can rejuvenate, and blend with nature. 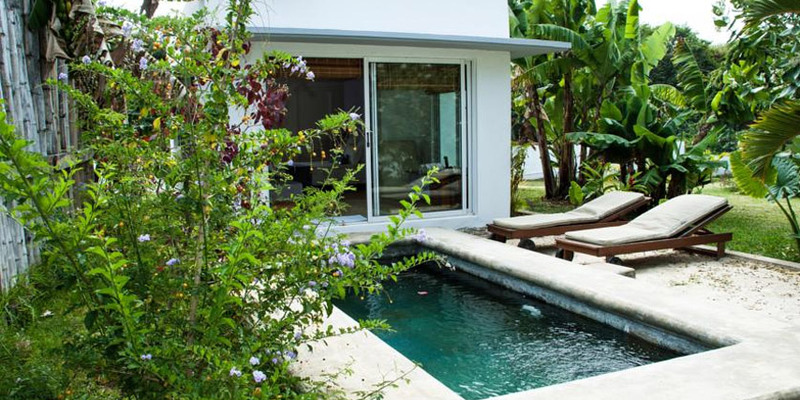 Besides, you have the option to lodge in the villa which features a terrace and a shared bathroom. To get the real feel of the Mauritian way of life, set yourself to explore the nearby villages on foot, by bicycle, by scooter, or by car. Meet the local inhabitants, and get a taste of the Mauritian culture through the typical snacks sold in the streets such as chilli bites, dhollpuri, faratha, halim and other many local food. Adorned with one of the most stupendous landscapes and lush green environment of the island, the 7 Cascades Restaurant, Bar & Lodges awaits you in the South Western Coast of Mauritius. Blessed with a rich flora and fauna, the lodge is ideally situated among 11 spellbinding waterfalls, 12 abseils, deep ponds, cliff jumps, impressive lakes and rivers, not to mention the scenic Tamarind Falls-a true haven of natural beauties. Perfect for romantic couples, family or friends alike the eco 7 Cascade lodges is a totally different retreat experience, suitable for people longing to connect with nature and adventures. This is where you will experience nature at its best! Much considerate has been taken in regard to nature while building the 5 identical lodges which are composed of one spacious cozy bedroom, one bathroom, a lounge area with a mini bar as well as a veranda. The lodges can accommodate 2-4 persons. They have been designed to provide guests with peace and quiet in the privacy of their lodge during their stay. They are surrounded by plants, most of them being endemic to the island. The spacious and welcoming restaurant can accommodate three functions at the same time without them interfering with one another. The restaurant consists of three compartments: the main restaurant area, a Conference room and a Lake view terrace with a mind blowing view on the Tamarind Falls Reservoir. It also provides facilities such as a bar, a tv for sports fans, a pool table, a dart game as well as a ping pong table. You can also try the fun and adventurous outdoor activities such as trekking, canyoning, archery, 6-Aside football, tennis volley, petanque, and croquet. A sanctuary of self-replenishment in the South Eastern Coast of Mauritius lies the Nativ Lodge & Spa in the historical village of Mahebourg. 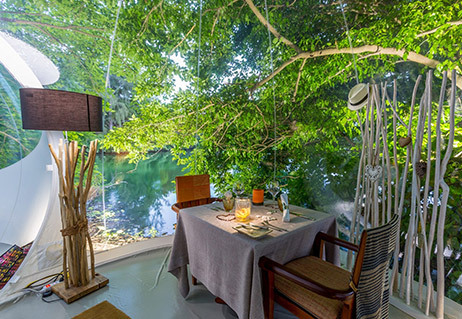 This eco lodge is nestled closely on the bank of La Chaux River surrounded by a vast tropical garden which is perfectly integrated in the wilderness of the blissful nature. Away from pollution and stresses of the routine life, this eco refuge offers you a peaceful and intimate environment with its inviting eight eco-friendly lodges which are divided into 2 categories, notably: Standard and Prestige. This nature retreat is ideal for romantic couples, families and friends alike. The lodges reflect the historical dimension of the region. They are inspired by contemporary and minimalist design. Each lodge is identified by a colour and a theme corresponding to a part of the landscape of Mahebourg. Natural and recycle materials such as stones, wood and concrete are used in the making of the lodge. 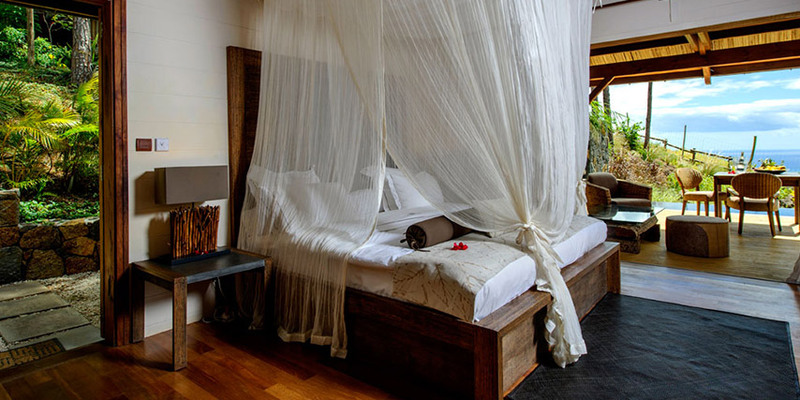 The beds facing a bay are an open invitation of nature to meditate and rest. The lounges overlook a private garden furnished with sun loungers for some relaxing time in nature. The prestige lodges have private pools where you can swim without any disturbance. The service at the Nativ Lodge & Spa is simply enchanting, reflecting the Mauritian hospitality. The multilingual staff will be around to cater for your every need. A variety of specialized services is provided for guests, for instance, baby sitting, dry cleaning service, laundry facilities and free Wi-Fi. The bar-restaurant fully opens on the river La Chaux and the garden, allowing you to peacefully enjoy savouring local cuisine in the beautiful nature. Breakfast is complimentary at Nativ Lodge & Spa, so you do not need to pay extra. The head chef offers delicious fusions using local produce: fruits and veggies from the garden and the market, and seafood from the local fishermen. There are exquisite dishes that will make you wish to visit the restaurant more often! The Nativ Lodge also offers an evening program, consisting of music events, local dance show or many other events for you to discover and lean more on the vibrant local culture and music. Surrender yourself to the charming setting of the eco-friendly Andrea Lodges located in the Southern Coast of Mauritius in a totally secluded area. Perched between the gorge of the Anguilles River and impressive black basalt cliff top to the beach and sea, the Andrea Lodges promises you eco experiences in the midst of wilderness-a perfect spot for adventure-packed activities, along with cozy yet eco-friendly lodges. Andrea Lodges Mauritius offers 10 sea-facing chalets which are immense with light colours and are designed in a rustic and refine décor reflecting a peaceful harmony with the surrounding nature and views. Fully furnished, the lodges are equipped with ceiling fans, mosquito nets, tea and coffee making facilities and en-suite shower room. Each chalet has a private terrace where guests can sit and admire the views and soak up the tranquility of the location. You can swim leisurely at the main pool which is found near the restaurant. The swimming pool offers incredible ocean view; this is where you can relax and let go. Those who want an adrenalin rush can indulge in various fun activities, including guided cliff top walks through the protected deer park, excursions to local sites of interest such as waterfalls, beaches, mountain biking and horse riding. The roof thatched restaurant overlooks unique views, and welcome guests with its delicious local meals that can be taken in the dining area. At breakfast there is a choice of full English or continental fare. An a la carte menu operates at lunchtime and picnic lunches can be arranged for those away from the lodge. Dinner is a set 3-course meal. 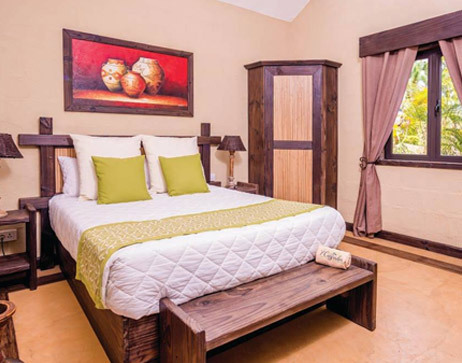 Located in the South Western part of Mauritius near Chamarel, the small rustic farm and lodge - La Vieille Cheminée is nestled on the top hill side overlooking a panoramic view of the verdant countryside. If you are seeking for a nature escape with your family, friends, or with your beloved ones then this is definitely the place to be. Nature at its best - La Vieille Cheminée is stretched over 75 hectares of forests with two meandering rivers which flow through a vast vegetation of indigenous and exotic plants. The entrance to the estate is overshadowed by an ancient stone chimney - the last remnants of the village’s former sugar mill, dating from 1874. Exuding authenticity, experience a wonderful hideaway where you can connect with the flora and fauna. La Vieille Cheminée features a horse farm, an outdoor pool, a grocery shop, and Creole-styled cottages which come in three categories depending on your preferences. The cottages are meticulously decorated with rural charm, highlighting Mauritian culture. They are mostly adorned with wooden furniture, and are fully equipped. They even consist of a fireplace and private entrance. Each en-suite bathroom is equipped with a shower and free toiletries. Complimentary sparkling wine is provided for all guest on honeymoon. Some of the cottages offer incredible view over the mountains and towards the Rhumerie de Chamarel. La Vieille Cheminée offers barbecue facilities and guests can prepare meals in the privacy of their self-catering cottage. A number of restaurants serving a variety of local and international cuisines can be found nearby. You can also have free access to the numerous trails and paths on the property to breathe some fresh air. Additionally, there is the farm office where you can watch horses come back from their pastures, or have a leisure ride. Ideal location to discover: Waterfalls, Coloured Earth, and Adventure Park. Encompassed by luxuriant palm trees and exotic green vegetations, EvaZion lodge is set in a very peaceful and bewitching location at Deux Frères in the Eastern Coast of Mauritius. Nestled between the mountains of the Old Grand-Port and the flanks of the Grand River South East, EvaZion becomes a cocoon where you can completely rejuvenate. This is the place where you can immense yourself in a Zen atmosphere, relax and contemplate the natural beauty around you, or enjoy adrenaline-packed adventures. From family orientated rooms to quieter rooms for couples, the rustic and charming atmosphere of each room has been designed to match everyone’s expectations. Every room includes a private bathroom a flat-screen TV with cable channels, and other room facilities. Certain rooms feature a seating area where you can relax. You will definitely enjoy the magnificent views of the sea, mountain or pool in certain rooms. Guests can take a soothing swim at the year round outdoor pool which offers a totally different experience with its verdant remote location. 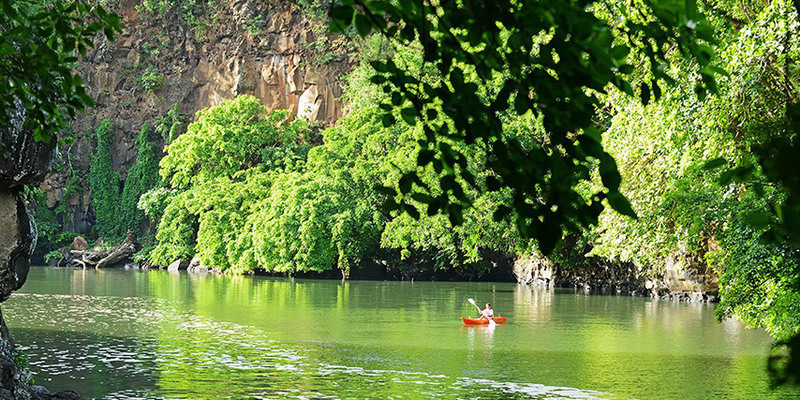 Additionally, water sports such as Kayaking is available for those who are curious about discovering the nearby longest River of Mauritius, and the gorgeous Ile aux Cerfs Islet. You cannot miss the local food at the ‘La cote Sauvage’ restaurant where delicious and authentic Mauritian cuisine is offered. Serenely engulfed by a virgin forest in the South Western part of Mauritius, near the enchanting Macchabée forest Hiking Trail, and Le Petrin Information Center; the Domaine de L’Arbre du Voyageur offers an off beaten track retreat for nature lovers. With a refreshing stream nearby and lush vegetation around, this 3-star eco-lodge is a sanctuary of peace and serenity where you can reconnect yourself with the wilderness of nature. Meticulously designed to meet an eco-friendly standard, the guesthouse offers 8 rustic yet elegant cottages. The rooms have private furnished balconies where you can contemplate the blissful nature. Bathrooms have showers and complimentary toiletries. Conveniences include desks and coffee/tea makers, and you can also request irons/ironing boards. Known for its interesting hiking spot, the location of the guesthouse is ideal for nature lovers who wish to go deep into the pristine nature to discover the tropical flora and fauna. The guesthouse has a restaurant and bar, where you can comfortably enjoy your meal and drinks in the midst of nature. A complimentary breakfast is included during your stay.